Aaron Monaghan as Martin in The Second Violinist. 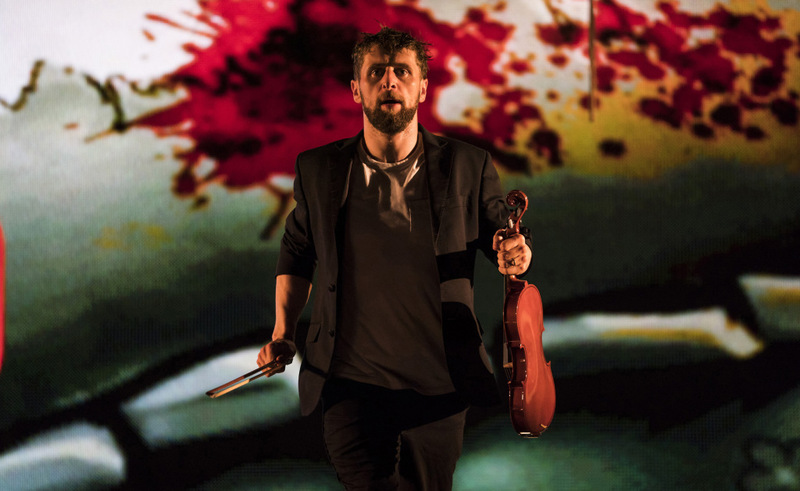 The Second Violinist, by composer Donnacha Dennehy and librettist Enda Walsh, is an uncommonly complex and multi-layered work labelled as ‘opera’ but shaped as a fusion of opera, theatre and cinema. Its peculiarity lies in the very contemporary setting, which has a surprising effect on the audience and the result is refreshingly grotesque. The rich heritage of an art form like opera loudly clashes with the triviality of modern, everyday life: the little wars that can spoil a marriage, the frustrations of work, the omnipresent technology, the awkwardness and fake closeness created by social media. In the words of Walsh, this work deals with “the suburban, the inconsequentialness of people’s lives”. No better or clearer metaphor for the senseless routine than the image of the treadmill, centrally placed on the stage, and on which all of the characters walk, alternatively, during the show. But this triviality, initially portrayed with humour, even comically, soon turns into heavier matter: a progressive mental breakdown of the protagonist with tragic outcomes. The second violinist, played dynamically by Aaron Monaghan in a silent role, lives in a world where dreams are broken and love is unattainable, while (spiritual) youth is a only a distant memory. “And love it bleeds in the dirt […] it rots in the dirt”, gloomily sings the chorus. The strength of this opera lies in its modern themes and in their effective portrayal through music: loneliness in spite of an uninterrupted flow of communication, a sense of failure and lost identity, alienation. These themes intertwine with a more traditional one (going back, in theatre, at least to Tennessee Williams): that of an almost mythical lost youth, here exemplified in the character of Amy, the wife (Sharon Carty) and her counterpart, her unmarried, carefree friend Hanna (Máire Flavin). Sharon Carty as Amy in The Second Violinist. The recalled image of Amy, as a student, naturally letting her dress slip down on a river’s bank to reveal her naked body, evokes precisely that of a legendary nymph; so much so that Matthew, Amy’s husband (Benedict Nelson), cannot reconcile this image with the way he knows his wife, now chiefly preoccupied and absorbed in interior decoration projects (incidentally, they grey chosen for the apartment’s walls is here more than a choice dictated by the latest fashion, and meaningfully resonates with the mood of the story). Hanna’s sinuously shaped and flowing dress, also, bears more than a casual hint to the ancient Greek female iconography: she is a sort of winged Nike of Samothrace as she enters the story to rescue Amy from her dull life. From a musical point of view, dissonance defines the score: strident recorders, heavy percussions, jarring and oppressive string sounds. This is an utterly original work, but, to give you an idea, think Bernard Hermann’s Psycho soundtrack, without the melody part. Like a sophisticated cameo, both the libretto and the music are disseminated with more or less explicit references to singular Renaissance composer Carlo Gesualdo, whose sublime music and troubled life, Dennehy said, inspired the opera. Come ne porti il cor, porta i tormenti. Bring away my torments, as well as my heart. What we are witnessing here is possibly the genesis of a monster. The madrigal, which is originally a love poem, takes on a whole new meaning. The fleeting beauty is not a woman (or not only), but the beauty of living, the beauty of youth and juvenile dreams. As a mounting sense of existential failure and apathy conquers the protagonist, cynicism sets in and tragedy ensues. Performances on the opening night were strong across the board. Soprano Máire Flavin confirmed her trademark to be a blend of powerful scenic presence and a distinctive, mellifluous, honey-like timbre. Mezzo-soprano Sharon Carty was simply outstanding, sharp and touching at the same time. Benedict Nelson had a full, resounding baritone voice. With all their individual qualities, you may have perhaps wished for a more marked, perceivable difference in the female characters’ voice ranges and timbre, as to immediately identify the spiritually old, disillusioned Amy (mezzo) from the ‘younger’ and lively Hanna (soprano). The young American conductor Ryan McAdams directed with energy, confidence and ease the Crash Ensemble, bringing to life the score’s full depth and complexity. This production is certainly remarkable but not without some minor flaws. The narrative structure may not be that obvious from the start (is it flashbacks we are seeing, or two coexisting stories? ), and that’s where, maybe, the common cinema trope of the flashback may have been taken a step too far in this work. Whether we want to read this ambiguity as a function of the protagonist’s alienated mind or not, the staging still works against narrative clarity, and falls victim of redundant, contemporary cinema-like plot complications. The libretto, while thematically inspired and perfectly sustaining the dark mood of the opera, wants for lyrical sharpness. This is no fault of the author, who is a prose and not a poetry writer. These are quite two different languages, each with its own merits; but the latter adapts much better to opera, allowing it to fulfill its nature of uniquely soul-piercing art. Even so, this is utterly powerful, original and gripping work, with brilliant music at its core underpinning all the coexisting sensorial threads. All of the essential elements of opera are intact here: universality, tragedy, heartrending emotion. This is that type of artistic experience that lingers in your head, making you want to go back to it to decode it and unearth its richness. In spite of the themes’ heaviness and the atmosphere’s darkness, there is an inherent freshness to this work, a surprising lightness to it: it’s the lightness of fearless, risk-taking creativity. Donnacha Dennehy and Enda Walsh prove that opera is anything but dead, and Ireland may be proud to show the world how it’s done. The Second Violinist is produced by Landmark Productions and Wide Open Opera. It has first been presented at the Galway International Arts Festival last July and it was the winner of the Fedora Generali Prize for Opera in 2017. It will run as part of the Dublin Theatre Festival until October 8 at the O’Reilly Theatre.